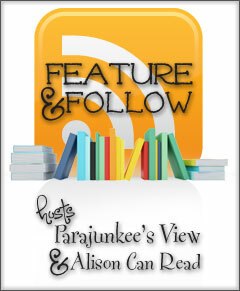 Feature & Follow is a weekly meme hosted by, Parajunkee andAlison Can Read. Every Friday, each host will have their own Feature Blog which allows them to show off more new blogs! It is a fun way to not only gain new followers but to meet and make new blogger friends! Question: What New Years blogging or writing resolution have you placed on yourself? Answer: I wouldn't say I have "resolutions" per say, but I did put in place 2 blogging tasks, 1 social task, and 3 reading challenges. Check out my post, 2013 Reading Challenges. Please share! What are your blogging resolutions? I wish I could be part of that club! I don't know of any other book bloggers in my area! Hi Tamara! A nice set of resolutions, I too have got a few Author Interviews due to be posted soon. New e-mail subscriber! I really want to do an author interview, but they totally intimidate me! O my word, I'm reading The Clockwork Prince right now too!